The DL sealed connector series has a mechanism that detects when terminals are not inserted completely. 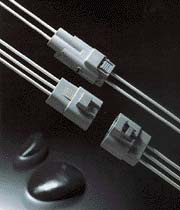 The series consists of 2.3mm type covering an extensive array of applications from signal circuits to power circuits. -The connector mechanism only allows the retainer to be set when the terminal is completely inserted. -These connectors can be directly secured to a bracket on the car body. - In addition, an extra clip can be attached to the connector to secure it to the car body.